In the early 1870s, the Edinburgh Castle was a popular music hall and gin palace on Rhodeswell Road, Limehouse, London E14. Such establishments were often the target of the temperance movement and other moral crusaders and in the summer of 1872, Thomas Barnardo erected a large mission tent in front of the building. Each night, congregations of up to two thousand packed the tent to hear the evangelical preaching of Joshua Poole — himself a reformed drunkard — and his wife Mary. In October of that year, a severe drop in its trade led to the Edinburgh Castle's 39-year lease being put up for sale. Barnardo immediately launched an appeal for funds to buy the property, both as a more comfortable alternative for his increasingly chilly tent, and also as an opportunity to replace the 'citadel of Satan' with a platform from which to proclaim the Christian Gospel. Just in time, Barnardo manage to raise the necessary money to acquire the premises. After initial renovation work was completed in February 1873, the front section of the former gin palace was reopened as a 'British Workman's Coffee Palace'. The Edinburgh Castle was an immediate success. The original bar layout was retained but redecorated and regilded, with the novel feature of 'gasoliers' (gas chandeliers) being installed. As well as the bar, which served coffee, tea, cocoa and other non-alcoholic drinks, the premises also offered newspapers, a library and reading room, and a smoking room. The music hall section of the building was converted to become the People's Mission Church where Barnardo acted as minister for the following nine years. In 1882, major structural problems were discovered in the building, necessitating a major reconstruction of the property. Funds were readily forthcoming and the new and enlarged premises, now able to hold over three thousand people, were opened in January 1884. The Edinburgh castle location is shown on the 1896 map below. 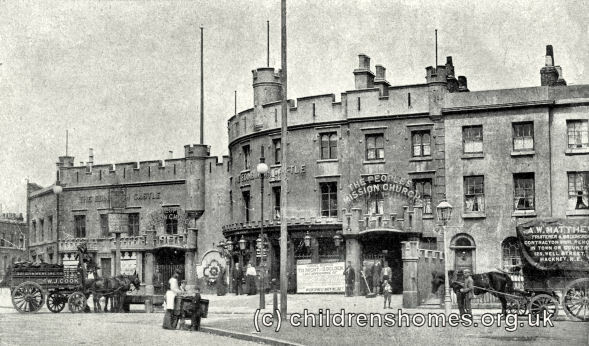 With the success of the Edinburgh Castle, Barnardo decided to open another coffee palace and mission hall, to be known as the Dublin Castle, on the Mile End Road. However, the project was marred by a 'turf wars' dispute with one of Barnardo's rivals, Frederick Charrington, who also had plans for a mission hall in the area. The Dublin Castle opened in 1875 but never achieved the same success as its predecessor. Following Thomas Barnardo's death in 1905, his body lay in state at the Edinburgh Castle for three days before being taken for his funeral and interment at the Girls' Village Home at Barkingside. The Edinburgh Castle site no longer exists and the Mild End Stadium now covers the location.